The U.S. bishops’ committee leader on domestic justice said that clean air and environmental stewardship should be serious concerns within the pro-life movement. 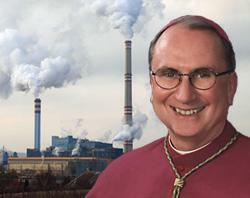 “It is hard to imagine a situation that so clearly illustrates this link between the environment and life issues as the impact of mercury and other toxic air pollution on children’s health,” said Bishop Stephen E. Blaire of Stockton, Calif., who heads the U.S. bishops’ Committee on Domestic Justice and Human Development. On April 8th 2010, the World Bank approved a controversial $ 3 billion loan for a coal-fired power station to ESKOM, the South Africa-based, state owned electricity utility, despite serious concerns from environmental organizations and the faith community. United States, Britain and Norway, Italy and the Netherlands abstained from voting for the coal loan due to unresolved environmental concerns and economic impacts on local communities. Eskom is the world’s fourth-largest power company and Africa’s largest carbon emitter, and accounts for 40% of South Africa’s total emissions. The loan raised serious environmental concerns such as pollution and greenhouse gas emissions, and raised questions about the World Bank’s commitment to renewable energy sources.